Anti-Semite Pope Francis Says Israel Should Give Jerusalem to the Arab Muslims and Obey the Anti-Israel U.N.
Why is recognizing Jerusalem as the eternal capital of Israel causing [Pope Francis] such concern? I don’t know. Maybe he missed a few things in his Bible study, but according to Reuters, he’s making an appeal ahead of Trump’s publicity stunt to keep things United Nations-approved. That would be the same UN that has displayed breathtaking antisemitism in its chambers, time and again. So does it cause any eyebrows to raise that before making his comments, Pope Francis had a meeting with [so-called] “Palestinians”, as part of an inter-religious dialogue with the Vatican? I’m sure it was all quite innocent. “The Holy Land is for us Christians the land par excellence of dialogue between G-d and mankind,” he said. He spoke of dialogue between religions “and also in civil society”. And that’s great, but God deeded all of Israel to the Jewish people. As it is, they’ve broken that ancient agreement over and over again, by giving away the land, bit by bit. “The primary condition of that dialogue is reciprocal respect and a commitment to strengthening that respect, for the sake of recognizing the rights of all people, wherever they happen to be,” he said to the group. Except there has been no respect for the Jewish people from the ones who want to wrest Jerusalem from their hands. The pope spoke by telephone to Palestinian President Mahmoud Abbas about the crisis on Tuesday. Well, isn’t that special? When will he speak with Prime Minister Netanyahu? 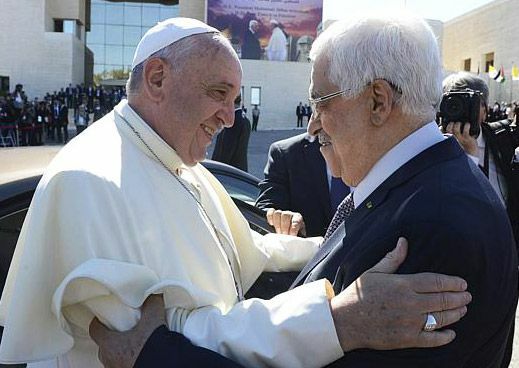 This pope is not a friend of Israel… Full diplomatic relations were reached in 1994 between the Vatican and Israel, with each pope since that time visiting both Israel and Palestine. This pope has his own thing going on, however. When Francis visited the Holy Land in 2014, he flew directly by helicopter from Jordan to what the Vatican program called the “State of Palestine” and visited Israel last. This irked Israel because his predecessor had always gone first to Israel and entered the territories from Israel. And the following year the Vatican recognized something that does not exist: The State of Palestine. Pope devil can sit at thrown of 666. The church should hang him high st. Peters basilica.Pope John Paul is a saint!